...then it might be time for an eye exam. Dr. Skeete & Associates, P.C. is a primary care optometric practice providing comprehensive eye care and optometric services to patients ranging from age five to senior years. We provide a wide range of eye care services including: comprehensive eye examinations for both eyeglasses and contact lenses; treatment of eye diseases; emergency eye care; and consultations for cataract and refractive surgery. In addition to providing eye health care services, we also dispense and sell most brands of contact lenses and provide access to alternative ocular health care products including eye vitamins and preservative-free artificial tears. For your convenience, you can schedule an appointment with one of our offices by clicking the appropriate button below. Likewise, if you have any questions regarding your insurance or the examination, please do not hesitate to contact us at (770) 623-8564 to contact our Peachtree Corners office or (770) 287-1623 to contact our Gainesville office. Many eye diseases can cause partial vision loss or blindness. 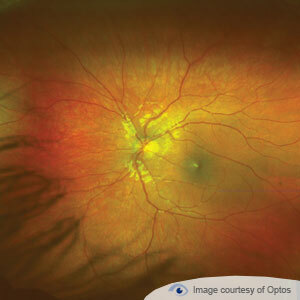 These diseases include: macular degeneration; glaucoma; diabetic retinopathy; and retinal holes and detachments. Similarly, systemic diseases such as diabetes; high blood pressure; elevated cholesterol; and tumors can manifest in the eye. Our office offers digital retinal photography as an efficient and comprehensive way to detect, analyze and diagnose various eye diseases. Retinal photography provides an annual eye wellness screening, an overview of digital images, and an in-depth view of the retina -- where diseases first manifest. 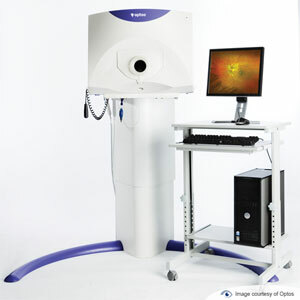 The Optomap Retinal Exam is a fast, easy and non-invasive way to evaluate the health of the eye. We are proud to offer this modern technology to our patients and highly recommend digital retina photography as part of your comprehensive eye examination. 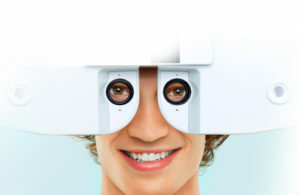 THE DIGITAL EYE EXAM THAT SHOWS YOU MORE. It's the new way to get your eyes checked. Clarifye pinpoints your prescription and gives your doctor a new level of specific detail, all digitally. Your eye exam just got easier. You know the old way with those dreaded test lens questions, "Which is better? One, or two?" And you think, "This must be important. What if I get it wrong? Wait! Let me see number one again!" Seriously, is this still how we do eye exams, by trial and error? The answer is not anymore. Precision – Clarifye features a whole new way to get your eyes checked. No other eye exam is more precise. Information – Gives you a more comprehensive understanding of your eye health and vision. Measures 5x more optical characteristics about your visual system. If you are a new patient, or are an existing patient that has some changes in their medical history, you will want to download and complete the patient information form and medical history questionnaire. Filling out these forms and bringing them with you to the office may expedite your visit.